The MONEY data type confuses the storage of data values with their display, though its name clearly suggests the sort of data it holds. 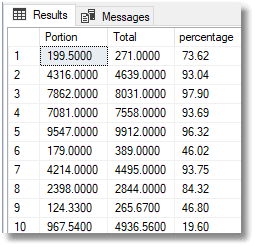 It is proprietary to SQL Server and allows you to specify monetary values preceded by a currency symbol, but SQL Server doesn’t store any currency information at all with the actual numeric values, so the purpose of this is unclear. It has limited precision; the underlying type is a BIGINT or, in the case of SMALLMONEY, an INT, so you can unintentionally get a loss of precision due to rounding errors. While simple addition or subtraction is fine, more complicated calculations that can be done for financial reports can show errors. Although the MONEY datatype generally takes less storage, and takes less bandwidth when sent over networks, via TDS, it is generally far better to use a data type such as the DECIMAL or NUMERIC type, which is less likely to suffer from rounding errors or scale overflow. A recommendation to avoid use of the MONEY or SMALLMONEY datatypes is included as a “Best Practice” code analysis rule in SQL Prompt (BP022). The MONEY and SMALLMONEY data types are accurate to roughly a ten-thousandth of the monetary units that they represent. SMALLMONEY is accurate between – 214,748.3648 and 214,748.3647 whereas MONEY is accurate between -922,337,203,685,477.5808 (-922,337 trillion) and 922,337,203,685,477.5807 (922,337 trillion). Although MONEY can be represented with a currency symbol, this information isn’t stored. Under the covers, MONEY is stored as an integer data type. A decimal number, the more usual choice for storing a monetary value, can range accurately between -10^38 +1 through 10^38 – 1. Several sqillion! The scientific world can tolerate tiny rounding errors and margins of error, but in finance a monetary calculation is either right or wrong. It is futile to argue that the odd cent or pence isn’t worth worrying about; I have, myself, been laughed at when I was a smidgen out from the right answer. Take the calculation in Listing 1, which is the simplest I can think of that illustrates the problem. Hmm: doesn’t look quite right. Let’s rerun the calculation with decimal arithmetic (you’ll need to round the total or cast to numeric with a scale of two). 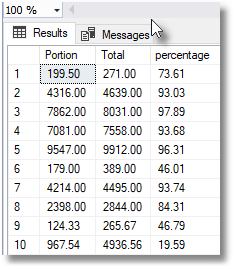 Incidentally, if you rerun Listing 2 but with the currency symbol in front of each of the values we’re inserting for Total and Portion, then you’ll still get the correct percentage values (under the covers, SQL Server implicitly converts the monetary values to DECIMAL (19,4) before inserting them into the table variable). The following figure shows the results of doing the reverse calculations i.e. 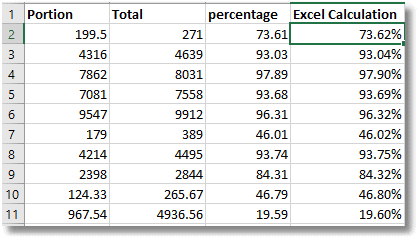 calculating the portion values, from the total and percentage. 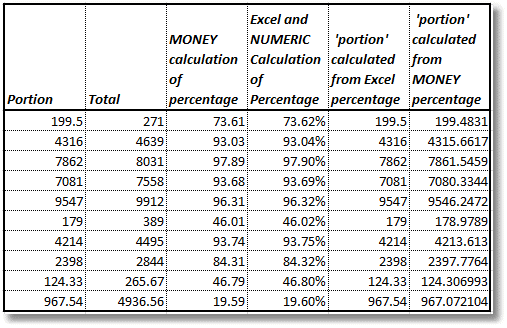 The fact that we cannot calculate the portion (or total) exactly, from the percentage values produced using the MONEY datatype (Listing 1), confirms that there are rounding errors in those percentage values. You can also get scale overflow errors if you try to calculate correlations the classical way, when using MONEY values. The values stored in the intermediate sum of the squares calculations can get enormous, if you are trying to find relationships between monetary values and other variables over many rows. This will cause errors in the value of the correlation. If you cannot avoid the MONEY datatype then it is far better to use the built-in StDevP() aggregate function to get the correlation. Basically, it pays to do calculations in DECIMAL (a.k.a. NUMERIC) with as many digits to the right of the decimal point as practical, and only using two or three decimal places to display the result. A scale of four digits to the right of the decimal point isn’t always sufficient for a datatype that is involved in any operations beyond addition or subtraction. Be aware also of ‘Bankers rounding’ in calculations. MONEY can be made to perform well and accurately if you know all the constraints and workarounds, such as using the NUMERIC datatype within calculations using division or multiplication, or employing the built-in aggregate functions. MONEY uses integers under the covers, so it is fast, and will generally use less storage, and is particularly suited to being transmitted across a network as TDS. However, it is for experts only. You could think of SQL Prompt code analysis as a machine-assisted code review. The rules that are used to check your code point out questionable areas that might be missed during regular testing. Phil Factor shares a SQL Prompt snippet called timings, which he uses as a standard testbed for getting execution times for procedures and functions. Can you please explain in more detail what you mean when you state that money is saved as a BIGINT or INT? Those data types don’t hold decimal values so I don’t understand how that would work. I thought I read somewhere that MONEY was stored as decimal with 4 positions to the right of the decimal point. 0) There is no such a coin as 0.0025cents or $0.000025. Please do not mix money and decimal numbers. 1) There is an approximately 2.5 times performance gain when MONEY type is in use. Thank you very much for the contribution. Yes, As I say in the summary, MONEY is a datatype that can be made to perform well and accurately if you know all the constraints and workarounds. I have used it myself in commercial applications. The reason that so many people warn against using it is that many developers aren’t aware of all the mistakes that can be made with the datatype. Even if the developers of an application get it all right, it seems to happen that a subsequent financial report written by a BI analyst who is unfamiliar with the datatype manages to put incorrect figures in front of business mangers. good catch, @disqus_dUluJ6VO33:disqus . Fixed now.